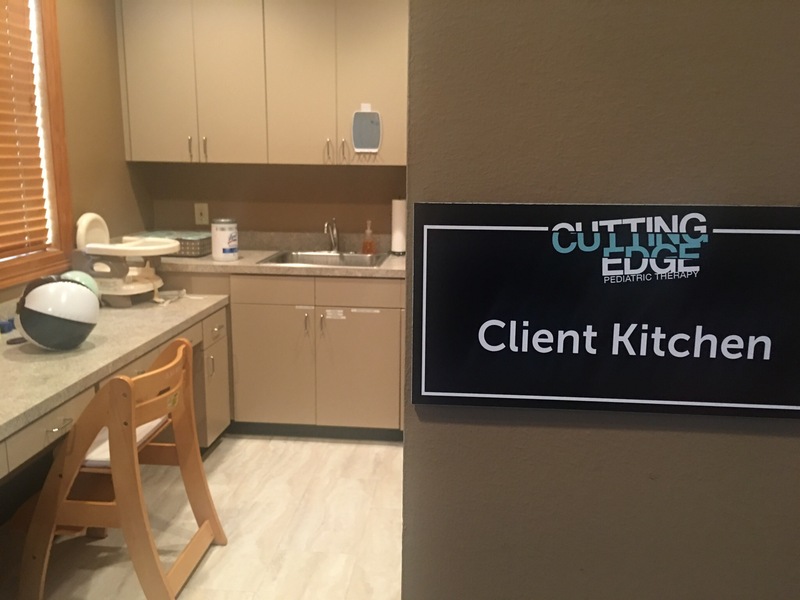 Did you know that we have a kitchen in our Houston office and that we use it as a treatment room for speech therapy? The kitchen lets us incorporate a variety of feeding and sensory tasks into our therapy. We work with things like following directions, naming, labeling; and then also getting used to different textures and temperatures. We have our own refrigerator, so we have different snacks and drinks we can use. We have juice boxes with straws because drinking from a straw is an important oral motor skill. We have jelly, which is a sticky texture to work with. We have fruit, which helps the kids work on chewing skills. We have whipped cream, which gives us a soft texture to work with to do things like drive cars through, for our tactile-aversive kids. We also have some thicker liquids to use with straw-drinking, to work on the muscles of the mouth. With these snacks on hand, the kids can work with thin or thick liquids, they can get messy, work on chewing, etc. We also incorporate sensory experiences with feeding by changing the sourness of the food. We have sour Gummi bears and regular Gummi bears, sour Skittles and regular Skittles. We have crunchy foods for chewing, and lollipops for working the tongue (this is important because you need to be able to elevate your tongue to make “l” and “n” sounds). We also incorporate different tools. We have bubblegum flavored gloves, items that vibrate, and sour spray which is useful for spitting and other oral seeking behaviors. We have a pinwheel that we can use to work on blowing for respiration. We also work on open cup drinking and straw cup drinking. We use the tabletop for working with messy mediums. We have pretend play with fake food, cutting it with fake tools, and finding ways to use it to incorporate our receptive and expressive language tasks like naming the items. These are just some of the many ways we have of working on oral motor skills, sensory integration, articulation skills, and many other important areas of speech therapy. Give us a call if you’d like to find out more!